The Piccolo Spoleto Festival is always a great opportunity for people of all ages to enjoy the talented local artists and performers that are based in Charleston, South Carolina. This year from May 25th to June 10th, thousands of artists made their way to Charleston, and even more visitors came to indulge their artistic curiosity, including a few of Alta Brighton Park’s own staff. Here’s a recap of the fun that was had right near our community at Alta Brighton Park – we hope next year you can join us as a resident! The 40th annual Piccolo Spoleto Festival in Charleston, South Carolina, focused on bringing attention to the outstanding local and regional artists of Charleston. This year’s festival spanned 17 days, featuring 700 events including visual art exhibits, classical music, jazz, dance, theater, and choral music. The festival even supported cultural events and community celebrations like poetry readings, children’s activities, craft shows, and film screenings. Each year, the festival’s goal is to promote local artists and performers as well as provide accessibility to all who are interested in witnessing their talent. Piccolo Spoleto encourages artist recognition by providing free admission to some of its shows. This year attendees had free access to nearly half of the events, and affordable ticket prices to all other shows. So if you’re in the area next year, mark your calendar because you won’t want to miss out on one of the longest-running outdoor fine art festivals in the United States! Piccolo Spoleto Shows, in Walking Distance of Home! While the festival has run its course this year, those who live at Alta Brighton Park will have easy access to attend next year’s events. Residents will be able to enjoy a short drive over to Charleston to get in on the endless fun being had at The Piccolo Spoleto Festival. And even closer to home, future residents of Alta Brighton Park will be able to take in Piccolo Spoleto at Nexton, right in their neighborhood. Our new apartment community, Alta Brighton Park, is located in Nexton’s Brighton Park Village, just off the I-26 corridor at exit 197, Nexton Parkway. A few of our team members even hopped in on the festival activities at Brighton Park Village. 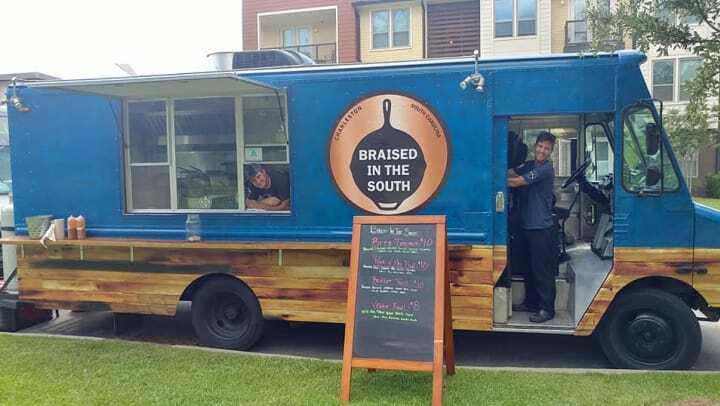 Our very own Alta Brighton Park team worked with Braised in the South, a food truck serving delicious southern-style food, to spread the word of our own fun that is happening at Alta Brighton Park in Summerville, SC. Our team handed out sling coolers and free meals to people who stopped by the food truck and signed up to tour our community. We had a blast getting to know our neighbors over delicious and smoky barbecued foods made right at the festival. Our staff enjoyed this festival and loved having the opportunity to partner up with other like-minded local businesses. This year there was “toe-tapping music” from Empire Strikes Bass and Sammy Miller and the Congregation, as well as “belt-loosening food and drink” enjoyed in Brown Family Park – located just a mile from Alta Brighton Park. If you’re interested in learning more about our luxury apartments for rent at Alta Brighton Park in Summerville, SC, reach out to our leasing team today to schedule a tour. We can’t wait to meet you!